Belconnen Arts Centre 118 Emu Bank, Belconnen, ACT, Australia. 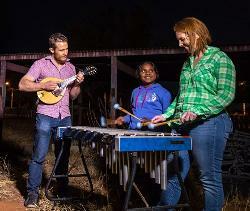 Be transported to a starry night in outback Central Australia through the magical combination of stories and music from the sky. This August The Griffyn Ensemble team up with indigenous songwriting legend Warren H. Williams in a not-to-be-missed night during 2018 Science Week. What do the stars mean to you? Griffyn have been asking this question since they first performed Southern Sky in 2012, and recently travelled to Tennant Creek to discover and create some more stories and songs about the stars. Members of Griffyn will join Arrernte man Warren H. Williams and Tennant Creek musicians in this special event which combines music, film, and astronomy to explore Western and indigenous conceptions of the night sky. One Sky, Many Stories features new works written by Williams and Griffyn alongside brand new reworkings of Griffyn's iconic Southern Sky (watch out for the CD release later this year). Griffyn percussionist Wyana O'Keeffe will also be returning to Canberra for this special showcase - there will be stars all round! Featuring some of Australia's most innovative leaders in chamber, folk, opera, new music, and composition, The Griffyn Ensemble seamlessly cross pollenate between genres of music and other artforms to create a unique experience of live performance, inspiring audiences and communities to question the world around us. Warren H Williams is an ARIA-nominated Arrernte singer, musician, and songwriter, and previous recipient of the NAIDOC Artist of the Year. Single tickets: $40 (full price); $30 (concession); $20 (Under 30); $10 (Under 18).